Uncheck both the Reopen documents on solution load and Restore Solution Explorer project hierarchy on solution loadcheckboxes. 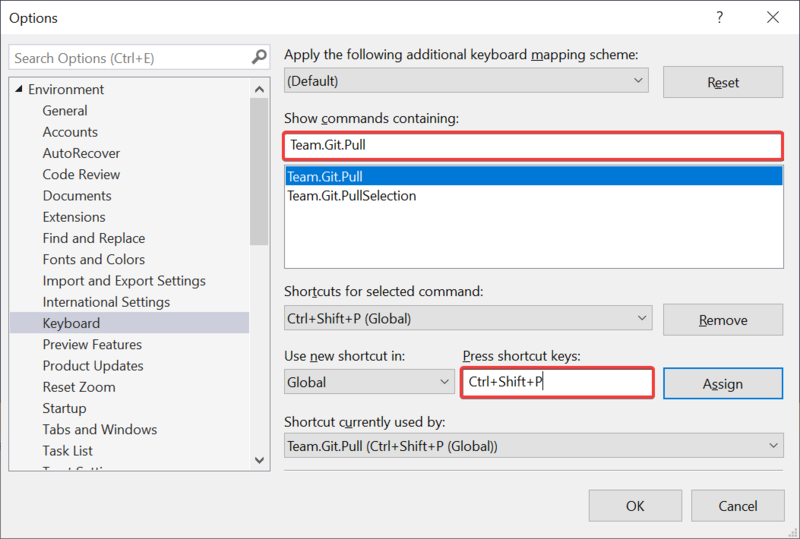 Previously, Team Explorer’s pull command was not a command you could assign keyboard shortcuts to but now it is. Go to search (Ctrl+Q) and type “keyboard” to find the Environment > Keyboard options page. From there, find the Team.Git.Pullcommand from the list. Then assign any shortcut to it and hit the OK button. I chose to use Ctrl+Shift+P. To enable this powerful feature, you can download IntelliCodefrom the Visual Studio Marketplace and install the extension.